If you are a sports fan you know the Golden State Warriors won another NBA title the other day by sweeping away Lebron and the Cleveland Cavs 4-0 in the NBA Finals. Three titles in four years for the Warriors. And many are not happy with Golden State and I am one of them as well as a NFL player. Myles Garrett of the Cleveland Browns says with Kevin Durant joining a already great team it “broke the league” I agree 1000% with Garrett! To this day I have a huge huge problem with Durant leaving OKC after the Warriors eliminated OKC in the playoffs a few years ago. I just think it was wrong for KD to join a already great team at GS with Curry, Green, Thompson in place on the team. A team that won over 70 games WITHOUT Kevin. Curry, Green and Thompson did a great recruiting job in getting Durant to come to the Warriors as a free agent. But I agree with Myles Garrett. And many other NBA fans agree also that Kevin Durant choice to join the Warriors was just unfair to the rest of the NBA. 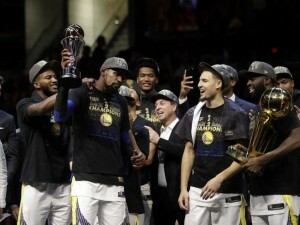 If you noticed NBA commissioner Adam Silver was not to happy on the stage when he presented the Warriors with another NBA title trophy. I was not happy too. Watching KD holding his second MVP Finals trophy in a row and watching Durant and his teammates kissing the title trophy made me go grab my remote and go watch something else on TV. It was not a good look in my opinion readers. It just was not. Now NBA teams are trying to figure out how to stop the Warriors from winning another title and then another title. Because truth be told the Warriors are still a young team and just make a few adjustments here and there to continue to win NBA titles. The NBA finals ratings suffered because fans are tired of seeing the Warriors. Tired of seeing them in joy after winning another title. Everyone knew at the start of the season who would play in the NBA finals….the Warriors vs. Lebron and the Cavs. So readers I hope and pray as a NBA junky that the rest of the NBA will wake up and knock the Warriors off their pedestal. No more damn titles. I do not want to see the Warriors in the Finals anymore! I do not want to see KD smiling after winning another title. I know Adam Silver is in agreement with me and many other NBA fans. Previous PostDo We Take For Granted How Great Lebron James Is? Why Is Macklemore Getting All This Publicity?